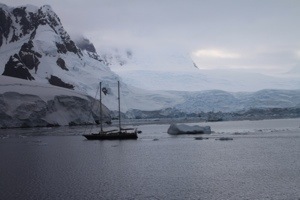 After a late night of dancing with the expedition staff, we got up early as the captain timed his entry into the Lemaire Channel at around 7 am. 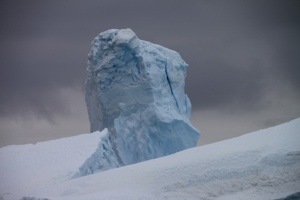 It is a very narrow passage with several icebergs and towering islands that staff admires. 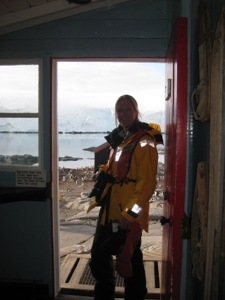 It was suggested we stand on the bow of the ship as we made the passage. 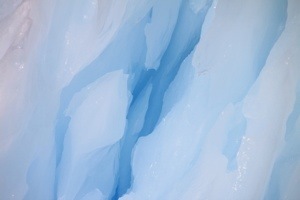 The glaciologist on board, Colin from Scotland, pointed out features in the ice and rocks as we passed by. 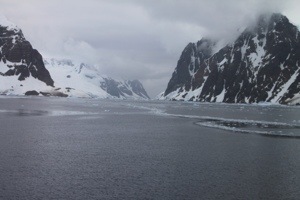 The sunny weather had quickly evaporated, and the overcast skies left us chilled as we admired the surrounding land mass. 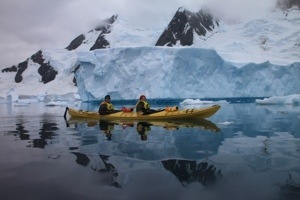 Given we were preparing to paddle at Pleneau Island through iceberg alley, the staff’s favorite place, most of us kayakers left the outside deck to maintain our body temperature. 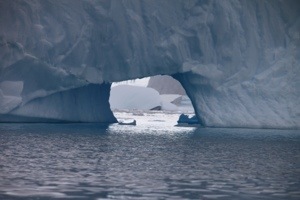 The paddle through iceberg alley was of course, spectacular. Now on my thirteenth day, I’m running out of exciting adjectives to use to describe this region! 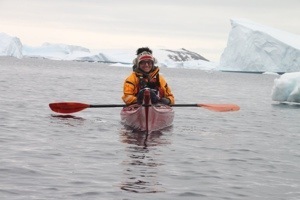 Though a heavy cloud cover and cold, the wind was non-existent and the conditions were perfect for paddling again!! 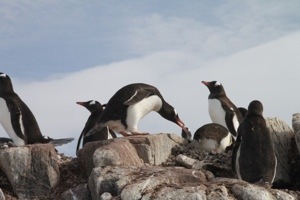 Penguins honked on the nearby island. 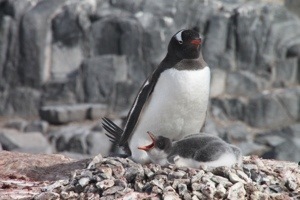 We spotted kelp gull chicks as well as a flock of cormorants after we made our way through a flurry of brash ice. 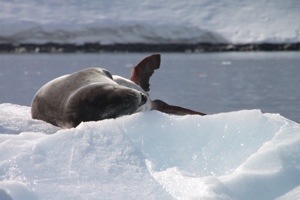 Leopard seals posed for us on the ice floes. 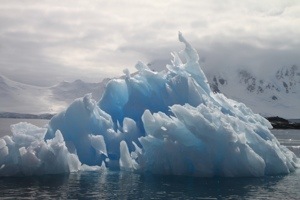 But the real draw to this area, as the name suggests, are the icebergs. 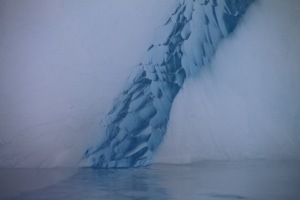 Icebergs of all shapes and sizes with arches and caves and blue streaks of fresh water that had refrozen within the snow crystals of the ice reflected in the tranquil water. 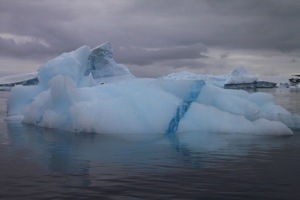 The icebergs collect in the shallow waters here, become trapped, and eventually decompose. It becomes their graveyard…definitely a unique cemetery! 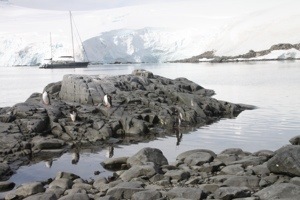 After a beautiful morning kayak, we visited Port Lockroy. This outing was a three part tour. 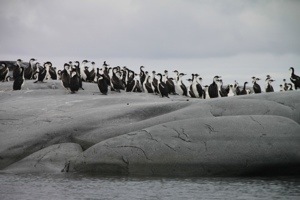 Due to the small landing sites, we were split into three groups with separate, simultaneous outings in the area. 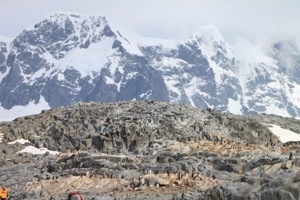 Our group started at Jougla Island where we visited another Gentoo penguin colony, saw lots of whale bones, and a few nesting cormorants. 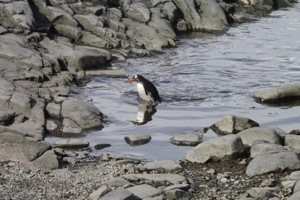 Aside from the first landing, this was one of the few times the kayakers had time to just sit and observe the penguins. 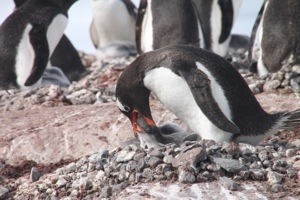 They build their nests with rocks so when the snow melts, the eggs won’t be flooded with cold, melt water. 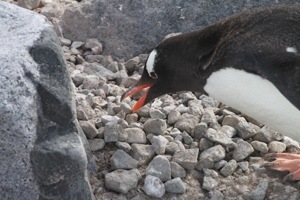 I watched a penguin hop down the rocks, select a pebble, labor back to its nest, and deposit its prize at least four times in a row. 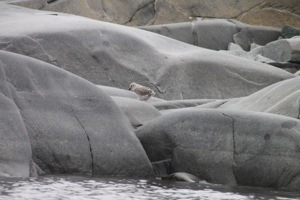 I’m not sure why it really needed rocks now as it’s chicks were born, but I admired its diligence. 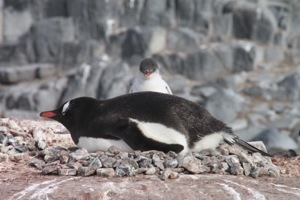 I also watched penguins fight with each other, moms feed their chicks, and others protect their nests from the Snowy Sheathbill. 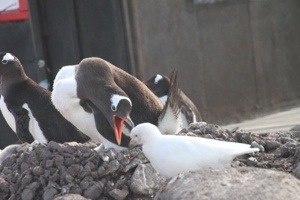 I’m told the Sheathbill simply eats the penguin poo (gross), so I’m not sure why the penguins felt so obliged to chase it away. Any less poo would certainly decrease the stench! 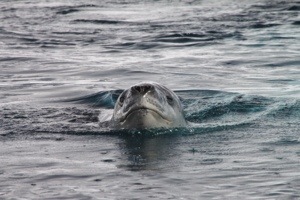 After inspecting Jougla Island, we took a zodiac tour around the bay. 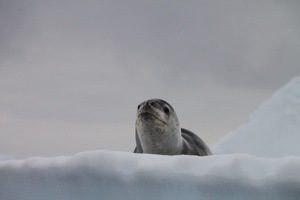 Fortunately for us there was a very playful leopard seal that circled our dinghy and tried hauling out of the water onto a very ornate, yet steep iceberg. 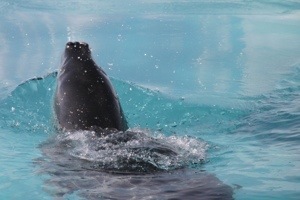 A pleasure to watch, yet quite difficult to get many good photos. 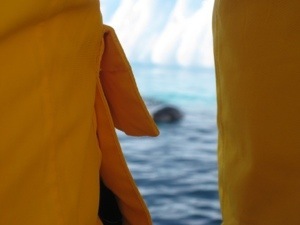 As kayakers, this was our first attempt to shoot wildlife while sharing a boat with several others, so for fun we took a picture of the yellow parkas we were issued, with the seal’s head poking in between because that’s what we felt like we were shooting most of the time! 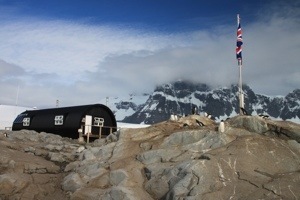 After our zodiac ride, we visited Port Lockroy which was the first base built by the British. 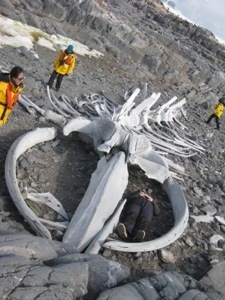 The area was discovered by the French in 1904. 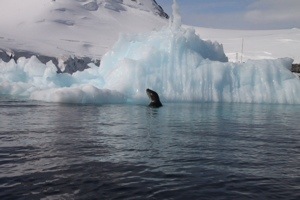 Whalers operated on the island until the 1930’s, and the British Base A was built during WWII to monitor activity through the Drake Passage as well as to strengthen claim to Antarctica. 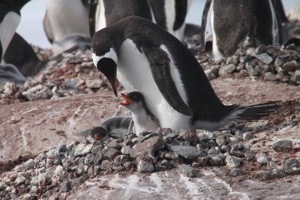 Argentina’s way to strengthen claim to Antarctica was to send a pregnant lady to the area and have the first baby born on Antartica soil. 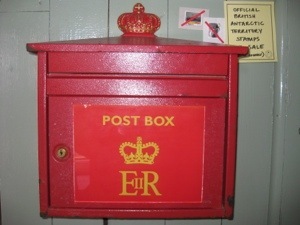 England’s way was to establish a post office. 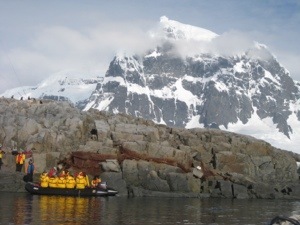 The post cards we sent from Detaille Island will come to Port Lockroy, and then to the Falklands, and then to the UK. 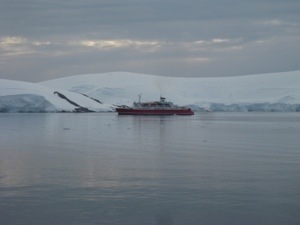 We actually saw the ship they will be carried on today! But I digress, due to weather, the English could not monitor the passage well. They also tried and failed at some botany studies and meteorology. 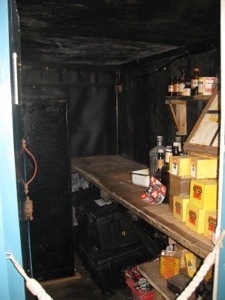 Port Lockroy is calmer than most other areas of the Antarctic, thus the meteorological studies were not representative. 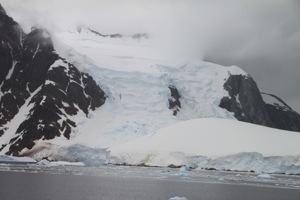 As such, Port Lockroy was closed in 1962.
ship carrying our post cards! 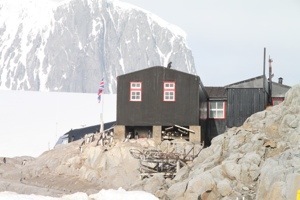 In the 1990’s, England was pressured by the Antarctic Treaty to restore the buildings that were in shambles or to remove them. They opted to restore its historical value. 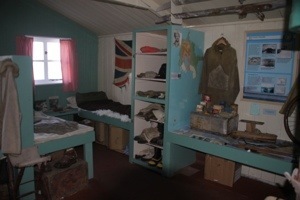 There are currently four people working for the UK Antarctic Heritage Trust at the base. 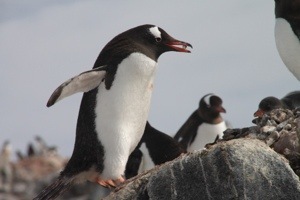 While most of their time is spent working on the history, they do some scientific studies on the penguins. 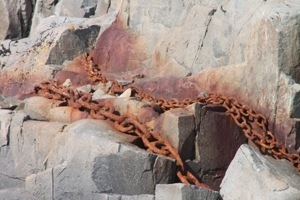 They have separated the island and don’t allow visitors to one area of the island. 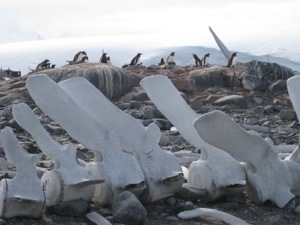 It seems there is no ill effect of visitors on penguins. 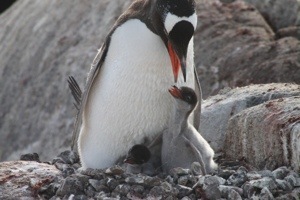 Currently, there are 798 chicks and 101 eggs. 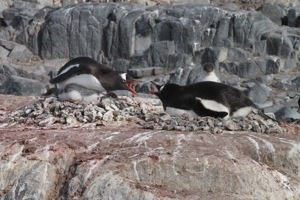 At this time of year, the 101 eggs either won’t hatch or the likelihood of these late births surviving will be low. 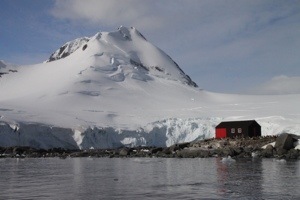 Port Lockroy is the busiest place in the Antarctic and receives nearly 15,000 visitors a season. They are up to 10,772 passengers so far this year. When they close up for the winter, they leave everything unlocked in case travelers need something. 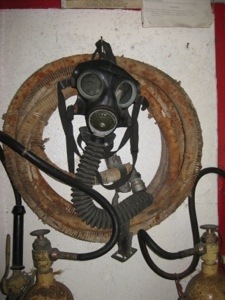 Currently, the buildings include a small museum and an impressive gift shop given its remote location. The sales from the gift shop items all went to restoring the buildings. Wow, what a great trip and a great post! 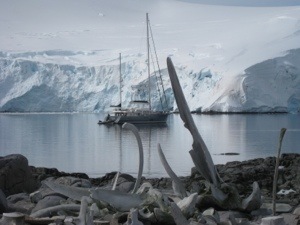 I loved the pic with the bones in the foreground and the ship in the background, as well as all the pics of ice. Thanks! 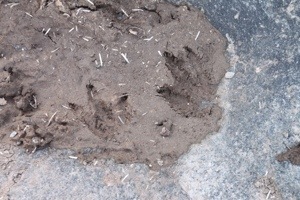 Enjoyed checking out your blog as well. It’s nice that you give. Now that’s adventure… Great photos, too!